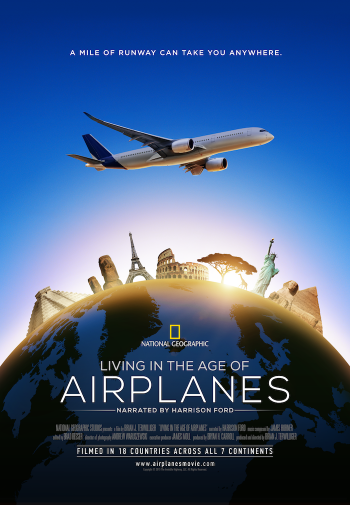 Living in the Age of Airplanes is a documentary directed by Brian J. Terwilliger that took six years to make. Shot in 18 countries with 95 different locations, the project’s attempts to show how airplanes is an integral aspect of our interconnected world ends up an engaging experience due to a variety of aspects. For one, the film’s score was created by James Horner (Glory, The New World), the late composer who was at the top of his field. Harrison Ford, whose passion for aviation has been well documented, is the film’s narrator. Blessed with what Terwilliger describes with an “A team” of talent, Living in the Age of Airplanes encourages us to look at planes with an entirely deeper perspective, and it’s this different flight plan that lifts this narrative to greater heights. Living in the Age of Airplanes is now out on Blu-ray, DVD, and Digital.